When a homicide occurs, KC Mothers in Charge (KC MIC) is notified immediately by the Kansas City Missouri Police Department. While police are securing the scene for proper investigation, we arrive at the scene to provide trauma-informed crisis intervention and peer-to-peer comfort, care and support to family members. As mothers who have been through the pain having our children stolen, we understand the incredible importance of peer-support to families during their darkest moment. In the roughly 30 days following homicides, we offer crisis-line support, make home visits, assist with funeral arrangements, host memorial vigils, meet emergency needs, help families navigate the criminal justice system and refer them to community resources. We provide weekly support phone calls and monthly support groups, teach coping skills to reduce stress and build resiliency, accompany families to court, host meet-and-greet events for families to build relationships, collaborate with partners to provide ongoing services, and offer families the opportunity to join KC MIC as Core Mothers. KC MIC is an integral partner of the Kansas City No Violence Alliance (KC NoVA). Working together, members of KC NoVA are implementing an evidence-based group violence reduction strategy called focused deterrence. KC MIC Core Mothers attends all KC NoVA call-ins, at which Kansas City police, FBI, prosecutors and counselors give potential offenders a chance to change their lives. During call-ins, Core Mothers tell their personal stories to parolees and at-risk individuals. We describe the pain, loss, and hopelessness that follow the murder of a child. Through our partnership with KC NoVA, since 2014, our Core Mothers have also reached more than 464 community members at-risk for perpetrating or becoming victim to violence in Kansas City, MO. KC MIC Core Mothers are active in prisons throughout the year. At correctional facilities, our Core Mothers speak to offenders about the impact of crimes on their lives, often bringing listeners to tears. Since 2014, our Core Mothers have touched the lives of more than 3,000 offenders by sharing their tragic stories of loss and empowering offenders to break the cycle of violence. The goal of our prison outreach efforts is to reduce recidivism by empowering offenders to take responsibility for the safety of the neighborhoods in which they will return upon being released. KC MIC mobilizes community members and neighborhood residents to get involved in violence prevention activities by canvassing high crime areas, intersections, and neighborhoods alongside agency partners and police to encourage residents to report crimes. KC MIC Core Mothers also provide outreach to at-risk students and youth at local middle schools and high schools. In 2017, KC MIC reached more than 1,200 community members and at-risk students through community outreach and education. 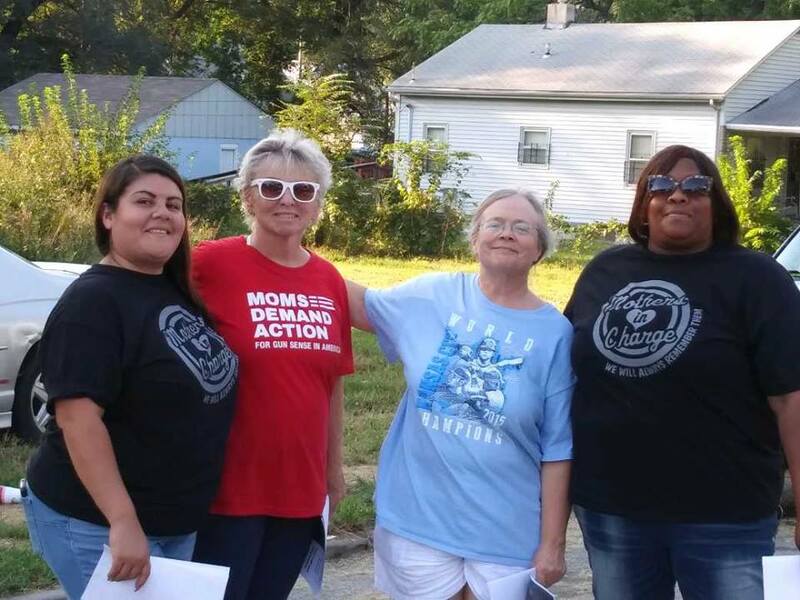 KC MIC also frequently partners with Moms Demand Action for canvassing events.